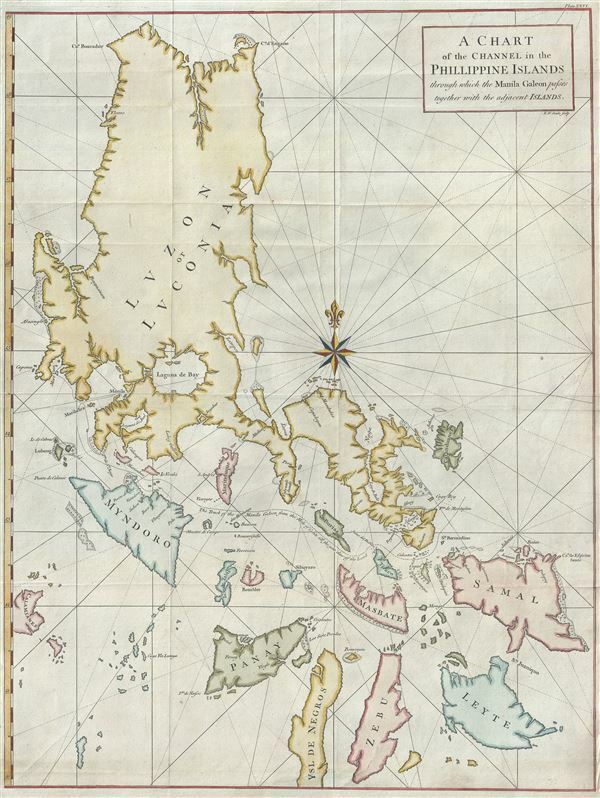 An English buccaneer's map of the Philippines. A Chart of the Channel in the Phillippine Islands through which the Manila Galeon passes together with the adjacent Islands. Most likely the British buccaneer George Anson's most important published map, this is his important 1748 nautical chart of the Philippine islands (Philippines). The map covers the northern Philippine Islands from Cebu to the northern tip of Luzon. It is intended to illustrate the track of the Spanish Manila Galleon trade as it enters the islands just above Mindoro, passes below Marinduque and Burias, above Tiaco, then past Capul and the San Bernardino Islands fore heading out to the Pacific just north of Samal. In 1740 Anson lead an ill-equipped expedition into the Pacific with the mission to attack Spanish dominions in South America. Though he failed in this mission, Anson did succeed in capturing the Spanish treasure galleon Nostra Seigniora de Cabadonga off Cape Espiritu Santo on June 20, 1743. The Spanish galleon was loaded with gold, silver and, more importantly, nautical charts depicting the trade routes used by Spanish Galleons between Mexico and Manila for the previous 200 years. This significant discovery allowed the British to disrupt Spain's trade in the Pacific and thus economically handicap the Spanish dominance of the New World. Following his capture of the Nostra its treasures were paraded through the streets of London in no less than 32 wagons. Anson was hailed as a national hero. The present map was engraved by Richard William Seale for the 1748 English edition of Anson's narrative, A Voyage Round the World, In the Years MDCCXL, I, II, III, IV. Anson, George. A Voyage Round The World, In the Years MDCCXL, I, II, III, IV, (London) 1748 (English Editon). Very good. Minor wear on original fold lines. Lower margin professionally extended.